A while ago, towards the start of my Toronto wedding photographer career, I decided to try a new technique every time I shot an event. As such, during the first dance at this Atlantis Toronto wedding, I pulled a set of battery operated Christmas lights from my pocket and started photographing. I first saw this intriguing technique used by Christman Studios in California and immediately decided to master it. To start with, I do not recommend any Toronto wedding photographer to use this technique without thorough practice. Probably about 95% of the shots I took during the first dance were unusable. However, I nailed a few and this is the best shot. The challenge when shooting such complex photograph is that the Christmas lights keep dangling in front of the camera and often cover the subject. However, one of the rules of documentary wedding photography is to take the safe shot first then go for the crazy shot. Also, I had a solid second shooter assisting me so I was sure I would have a usable images should my experiment go terribly wrong. What I like in this image is that the Christmas lights form a framing element in the picture. That composition technique is called frame in frame. Also, the bride is of Chinese descent and the red plays an important role in her culture. I photographed this wedding using a Canon 85 mm 1.2 lens shot at F2 to be able to create the big globes of foreground bokeh. In post production, a increase the intensity and the colour vibrance of the Christmas lights, did some skin retouching and of course colour corrected the image. The last step was to dodge and burn the image to draw the viewers' attention to the bride and groom. To ensure that I deliver my clients the best images possible I employ the skyscraper technique. According to this concept, I can offer the best value to my clients if I analyse the other Toronto wedding photographers work at Atlantis Toronto and top everything by adding new photography concepts into the mix. Immediately after the bride and groom hire me to document their wedding day, I plan to visit the venue, especially if I have never photographed there. Still, before visiting the venue, I analyse the best wedding pictures taken at that particular location. Once I have an idea what I'm competing against, I company my clients to the venue and we discuss concepts and their wedding photography preferences. It is then that I take pictures of the exact settings and when I'm back home I plan my future photo shoot. For a newbie Toronto wedding photographer with you events under his belt, a great idea would be to attend the wedding rehearsal. That will allow him to familiarize himself with the wedding ceremony and the particularities of the wedding reception. Atlantis Toronto is a very charming and versatile yet at the same time a challenging photography location. On the one hand, downtown Toronto skyline offers the perfect backdrops for wedding day or engagement portraits. 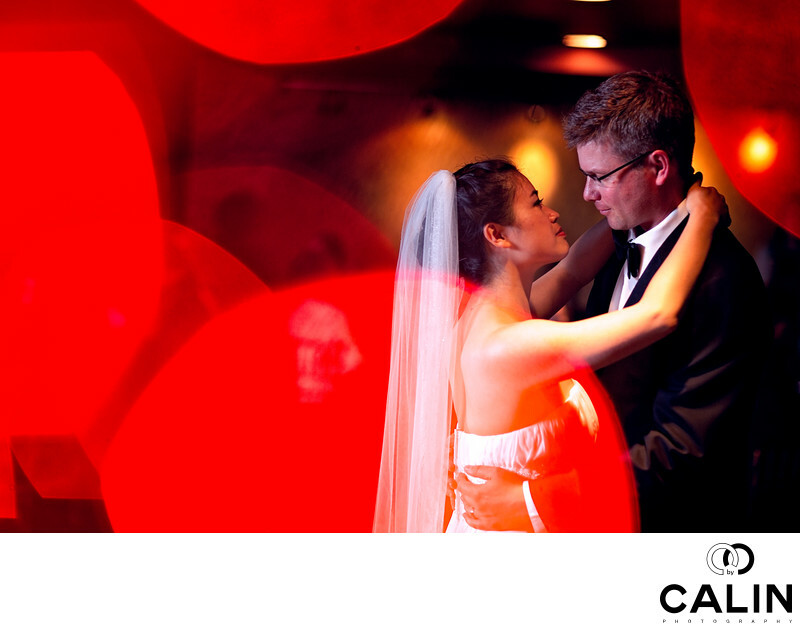 On the other hand, photographing the reception can be challenging given the dark ceilings that do not reflect light. Also, the huge windows provide a beautiful light but that comes from the wrong direction. Most of the scenes are backlit, situation that poses a challenge from an exposure standpoint.